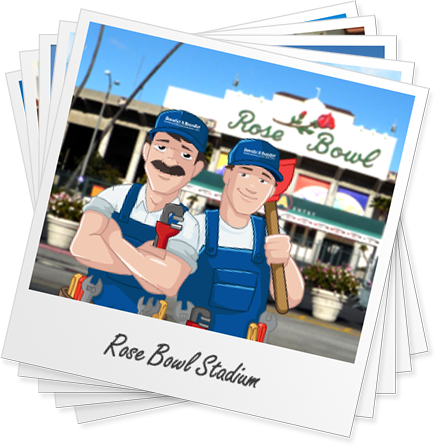 Benedict And Benedict has been providing quality plumbing services to Los Angeles and all of Southern California area since 1914. We constantly strive to provide the highest level of workmanship to our customers so that they contact us again in the future. We only use quality products and fittings so our customers can rest easy knowing that our repair job will last. We offer the following services and more, across all of Los Angeles. We provide 24/7 emergency plumbing service to all of Southern California. We have been servicing commercial buildings and businesses for over 100 years. Whether it’s a clogged pipe or a broken sewer, our plumbing technicians will fix the problem promptly and efficiently. Our technicians will fix your leaking faucets & your clogged sink drains quickly so you can get back to your day. We have been repairing and installing water heaters since 1914. Our plumbers will ensure that your water heater is working 100%. Our plumbers have been fixing drainage issues inside and outside the house for a century. We will make sure you are in good hands. Our expert plumbers will help make sure your bath & shower are draining smoothly and providing good water pressure. Toilets get clogged & broken. Luckily our plumbers have been repairing and unclogging toilets for over 100 years. Garbage disposals, if not working correctly, can cause odors. We will diagnose the problem and fix it promptly.